This article is about the geographical term. For the region that it applies to, see Middle East. For the ancient history of the region, see Ancient Near East. The Near East is a geographical term that roughly encompasses a transcontinental region centered on Western Asia, Turkey (both Asian and European), and Egypt (which is mostly in North Africa). Despite having varying definitions within different academic circles, the term was originally applied to the maximum extent of the Ottoman Empire. The term has fallen into disuse in English and has been replaced by the terms Middle East, which includes Egypt, and West Asia, which includes the Transcaucasus. At the beginning of the 19th century the Ottoman Empire included all of the Balkan Peninsula south to the southern edge of the Hungarian Plain, but by 1914 had lost all of it except Constantinople and Eastern Thrace to the rise of nationalist Balkan states, which saw the independence of Greece, Serbia, the Danubian Principalities and Bulgaria. Up until 1912, the Ottomans retained a band of territory including Albania, Macedonia and Southern Thrace, which were lost in the two Balkan Wars of 1912–13. The Ottoman Empire, believed to be about to collapse, was portrayed in the press as the "sick man of Europe". The Balkan states, with the partial exception of Bosnia and Albania, were primarily Christian, as was the majority of Lebanon. Starting in 1894, the Ottomans struck at the Armenians on the explicit grounds that they were a non-Muslim people and as such were a potential threat to the Muslim empire within which they resided. The Hamidian Massacres aroused the indignation of the entire Christian world. In the United States the now aging Julia Ward Howe, author of the Battle Hymn of the Republic, leaped into the war of words and joined the Red Cross. 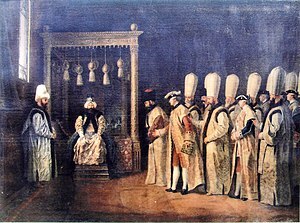 Relations of minorities within the Ottoman Empire and the disposition of former Ottoman lands became known as the "Eastern Question", as the Ottomans were on the east of Europe. It now became relevant to define the east of the eastern question. In about the middle of the 19th century Near East came into use to describe that part of the east closest to Europe. The term Far East appeared contemporaneously meaning Japan, China, Korea, Indonesia and Vietnam. Near East applied to what had been mainly known as the Levant, which was in the jurisdiction of the Ottoman Porte, or government. Those who used the term had little choice about its meaning. 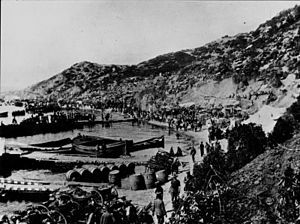 They could not set foot on most of the shores of the southern and central Mediterranean from the Gulf of Sidra to Albania without permits from the Ottoman Empire. Some regions beyond the Ottoman Porte were included. One was North Africa west of Egypt. It was occupied by piratical kingdoms of the Barbary Coast, de facto-independent since the 18th century, formerly part of the empire at its apogee. Iran was included because it could not easily be reached except through the Ottoman Empire or neighboring Russia. In the 1890s the term tended to focus on the conflicts in the Balkan states and Armenia. The demise of "the sick man of Europe" left considerable confusion as to what was to be meant by "Near East". It is now generally used only in historical contexts, to describe the countries of Western Asia from the Mediterranean to (or including) Iran. There is, in short, no universally-understood fixed inventory of nations, languages or historical assets defined to be in it. The geographical terms Near East and Far East referring to areas of the globe in or contiguous to the former British Empire and the neighboring colonies of the Dutch, Portuguese, Spanish and Germans, fit together as a pair based on the opposites of far and near, suggesting that they were innovated together. They appear together in the journals of the mid-19th century. Both terms were used before then with local British and American meanings: the near or far east of a field, village or shire. By the time of John Seller's Atlas Maritima of 1670, "India Beyond the Ganges" had become "the East Indies" including China, Korea, southeast Asia and the islands of the Pacific in a map that was every bit as distorted as Ptolemy's, despite the lapse of approximately 1,500 years. That "east" in turn was only an English translation of Latin Oriens and Orientalis, "the land of the rising Sun", used since Roman times for "east". The world map of Jodocus Hondius of 1590 labels all of Asia from the Caspian to the Pacific as India Orientalis, shortly to appear in translation as the East Indies. Elizabeth I of England, primarily interested in trade with the east, collaborated with English merchants to form the first trading companies to the far-flung regions, using their own jargon. Their goals were to obtain trading concessions by treaty. The queen chartered the Company of Merchants of the Levant, shortened to Levant Company, and soon known also as The Turkey Company, in 1581. In 1582, the ship The Great Susan transported the first ambassador, William Harebone, to the Ottoman Porte (government of the Ottoman Empire) at Constantinople. Compared to Anatolia, Levant also means "land of the rising sun", but where Anatolia always only meant the projection of land currently occupied by the Republic of Turkey, Levant meant anywhere in the domain ruled by the Ottoman Porte. The East India Company (short for a much longer formal name) was chartered in 1600 for trade to the East Indies. Near East remained popular in diplomatic, trade and journalistic circles, but a variation soon developed among the scholars and the men of the cloth and their associates: the Nearer East, reverting to the classical and then more scholarly distinction of nearer and farther. They undoubtedly saw a need to separate the biblical lands from the terrain of the Ottoman Empire. The Christians saw the country as the land of the Old and New Testaments, where Christianity had developed. The scholars in the field of studies that eventually became biblical archaeology attempted to define it on the basis of archaeology. For example, The London Review of 1861 (Telford and Barber, unsigned) in reviewing several works by Rawlinson, Layard and others, defined themselves as making: "... an imperfect conspectus of the arrow-headed writings of the nearer east; writings which cover nearly the whole period of the postdiluvian Old Testament history ..." By arrow-headed writings they meant cuneiform texts. In defense of the Bible as history they said: "The primeval nations, that piled their glorious homes on the Euphrates, the Tigris, and the Nile, are among us again with their archives in their hands; ..." They further defined the nations as "... the countries lying between the Caspian, the Persian Gulf, and the Mediterranean ..." The regions in their inventory were Assyria, Chaldea, Mesopotamia, Persia, Armenia, Egypt, Arabia, Syria, Ancient Israel, Ethiopia, Caucasus, Libya, Anatolia and Abyssinia. Explicitly excluded is India. No mention is made of the Balkans. 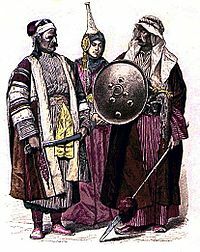 In the last years of the 19th century the term Near East acquired considerable disrepute in eyes of the English-speaking public as did the Ottoman Empire itself. The cause of the onus was the religiously motivated Hamidian Massacres of Christian Armenians, but it seemed to spill over into the protracted conflicts of the Balkans. For a time, "Near East" meant primarily the Balkans. Robert Hichens' book The Near East (1913) is subtitled Dalmatia, Greece and Constantinople. Throughout this article Norman uses "Near East" to mean the countries where "the eastern question" applied; that is, to all of the Balkans. The countries and regions mentioned are Greece, Bulgaria, Serbia, Bosnia-Herzegovina (which was Muslim and needed, in his view, to be suppressed), Macedonia, Montenegro, Albania, Romania. The rest of the Ottoman domain is demoted to just "the east". If Norman was apparently attempting to change British policy, it was perhaps William Miller (1864–1945), journalist and expert on the Near East, who did the most in that direction. In essence, he signed the death warrant, so to speak, of the Age of Empires. The fall of the Ottoman Empire ultimately enmeshed all the others as well. In the Travel and Politics in the Near East, 1898, Miller claimed to have made four trips to the Balkans, 1894, 1896, 1897 and 1898, and to be, in essence, an expert on "the Near East", by which he primarily meant the Balkans. Apart from the fact that he attended Oxford and played Rugby not many biographical details have been promulgated. He was in effect (whatever his formal associations if any) a point man of British near eastern intelligence. These were fighting words to be coming from a country that once insisted Europe needed Turkey and was willing to spill blood over it. For his authority Miller invokes the people, citing the "collective wisdom" of Europe, and introducing a concept to arise many times in the decades to follow under chilling circumstances: "... no final solution of the difficulty has yet been found." It remains then to consider whether the Great Powers can solve the Eastern Question ... Foreigners find it extremely difficult to understand the foreign, and especially the Eastern policy of Great Britain, and we cannot wonder at their difficulty, for it seems a mass of contradictions to Englishmen themselves ... At one moment we are bringing about the independence of Greece by sending the Turkish fleet to the bottom of the bay of Navarino. Twenty-seven years later we are spending immense sums and wasting thousands of lives in order to protect the Turks against Russia. There has been something pathological about the history of this Near Eastern World. It has had an undue share of political misfortunes, and had lain for centuries in a kind of spiritual paralysis between East and West—belonging to neither, partaking paradoxically of both, and wholly unable to rally itself decidedly to one or the other. The term middle east as a noun and adjective was common in the 19th century in nearly every context except diplomacy and archaeology. An uncountable number of places appear to have had their middle easts from gardens to regions, including the United States. The innovation of the term Near East to mean the holdings of the Ottoman Empire as early as the Crimean War had left a geographical gap. The East Indies, or "Far East", derived ultimately from Ptolemy's "India Beyond the Ganges." The Ottoman Empire ended at the eastern border of Iraq. "India This Side of the Ganges" and Iran had been omitted. The archaeologists counted Iran as "the Near East" because Old Persian cuneiform had been found there. This usage did not sit well with the diplomats; India was left in an equivocal state. They needed a regional term. It may be assumed that the most sensitive part of our external policy in the Middle East is the preservation of the independence and integrity of Persia and Afghanistan. Our active interest in Persia began with the present century, and was due to the belief that the invasion of India by a European Power was a probable event. The middle East, if I may adopt a term which I have not seen, will some day need its Malta, as well as its Gibraltar; it does not follow that either will be in the Gulf. Naval force has the quality of mobility which carries with it the privilege of temporary absences; but it needs to find on every scene of operation established bases of refit, of supply, and, in case of disaster, of security. The British Navy should have the facility to concentrate in force, if occasion arise, about Aden, India, and the Gulf. Until the period following World War I the Near East and the Middle East coexisted, but they were not always seen as distinct. Bertram Lenox Simpson, a colonial officer killed eventually in China, uses the terms together in his 1910 book, The Conflict of Color, as "the Near and Middle East". The total super-region consisted of "India, Afghanistan, Persia, Arabistan, Asia Minor, and last, but not least, Egypt." Simpson (under his pen-name, Weale) explains that this entire region "is politically one region – in spite of the divisions into which it is academically divided." His own term revives the Nearer East as opposed to the Far East. ... in India, in Central Asia, and in all the regions adjacent to the Near East, he still boldly remains a conqueror in possession of vast stretches of valuable territory; a conqueror who has no intention of lightly surrendering his conquests, and who indeed sees in every attempt to modify the old order of things a most hateful and unjustifiable revolt which must at all costs be repressed. This is so absolutely true that no candid person will be inclined to dispute it. These regions were occupied by "the brown men", with the yellow in the Far East and the black in Africa. The color issue was not settled until Kenya became independent in 1963, ending the last vestige of the British Empire. The term Near and Middle East, held the stage for a few years before World War I. It proved to be less acceptable to a colonial point of view that saw the entire region as one. In 1916 Captain T. C. Fowle, 40th Pathans (troops of British India), wrote of a trip he had taken from Karachi to Syria just before the war. The book does not contain a single instance of "Near East". Instead, the entire region is considered "the Middle East". The formerly Near Eastern sections of his trip are now "Turkish" and not Ottoman. Subsequently, with the disgrace of Near East in diplomatic and military circles, Middle East prevailed. However, Near East continues in some circles at the discretion of the defining agency or academic department. They are not generally considered distinct regions as they were at their original definition. In the 20th century, subsequent to major warfare and decades of intense political turmoil, the terms, such as Near East, Far East, and Middle East continued to be used, but evolved in their meaning and scope. This increased confusion, the resolution of which became the study of experts in the new field of political science. The new wave of diplomats often came from those programmes. Archaeology on the international scene, though very much of intellectual interest to major universities, was overshadowed by international relations. The archaeologists' domain became the Ancient Near East, which could no longer be relied upon to be the actual Near East. The Ottoman Empire was gone, along with all the other empires of the 19th century, replaced in the region with a number of republics with various affinities, regional and global. The many and varied specialized agencies that were formed to handle specific aspects of complex international relations, evolved with the terms. Definitions from the present came to be not in concert with those of the past. Reconciling these terms and their definitions remains difficult due to ongoing territorial disputes and non-free nuclear powers' territorial ambitions, putting any reconciliation of definitions out of scope of diplomatic corps in the classical sense. The ancient Near East is frozen in time. The living Near East is primarily what the agencies each define as a matter of practice; often guided by their political leadership. In most cases, this single term is inadequate to describe the geographical range in practical applications. This has resulted is multiple definitions used differently by each major region, power, or instituation. Some of the most influential agencies in the United States still use Near East as a working concept. For example, the Bureau of Near Eastern Affairs, a division of the United States Department of State, is perhaps the most influential agency to still use the term Near East. Under the Secretary of State, it implements the official diplomacy of the United States, called also statecraft by Secretary Hillary Clinton. The name of the bureau is traditional and historic. There is, however, no distinct Middle East. All official Middle Eastern affairs are referred to this bureau. Resorting to this verbal device, however, did not protect the "Ancient Near East" from the inroads of "the Middle East". For example, a high point in the use of "Ancient Near East" was for Biblical scholars the Ancient Near Eastern Texts relating to the Old Testament by James Bennett Pritchard, a textbook of first edition dated 1950. The last great book written by Leonard Woolley, British archaeologist, excavator of ancient Ur and associate of T. E. Lawrence and Arthur Evans, was The Art of the Middle East, Including Persia, Mesopotamia and Palestine, published in 1961. Woolley had completed it in 1960 two weeks before his death. The geographical ranges in each case are identical. ^ "Middle East, Near East". Style Guide. National Geographic Society. ^ "The Near East". Food and Agriculture Organization. United Nations. ^ "Near East". Oxford Dictionary of English (2nd ed.). Oxford: Oxford University Press. 2003. ^ Book VI, Chapters 14, 15. ^ Book VII, chapters 1, 2. ^ Bent, J. Theodore, ed. (1893). Early Voyages and Travels in the Levant. London: The Hakluyt Society. p. viii. ^ Meadows, Thomas Taylor (October–December 1855). "Chinese Insurgents and British Policy". Littell's Living Age. 47: 356–359. ^ Telford & Barber 1861, p. 14. ^ Telford & Barber 1861, p. 6. ^ Telford & Barber 1861, p. 7. ^ Hogarth 1902, p. 1. ^ "Literary Chat: Two Traveled Authors". Munsey's Magazine. XV (1): 121–22. April 1896. ^ Norman, Henry (June 1896). "In the Balkans – the Chessboard of Europe". Scribner's Magazine. New York: Charles Scribner's Sons. 19 (6): 653–69. ^ Miller 1898, p. ix. ^ Miller 1898, pp. 391–392. ^ Miller 1898, p. 479. ^ Miller 1898, p. 489. ^ Toynbee, Arnold J.; Great Britain Foreign Office (1916). The Treatment of Armenians in the Ottoman Empire. London, New York [etc. ]: Hodder and Stoughton. p. 595. ^ Mahan, Alfred Thayer (1902). Retrospect and Prospect: Studies in International Relations Naval and Political. Boston: Little, Brown, and Company. p. 237. ^ a b Weale, Bertram Lenox Putnam (1910). The conflict of colour: the threatened upheaval throughout the world. New York: The MacMillan Company. pp. 184–187. ^ Fowle, Trenchard Craven William (1916). "Preface". Travels in the Middle East: Being Impressions by the Way In Turkish Arabia, Syria, and Persia. New York: E.P. Dutton & Company. ^ "Near Eastern Affairs: Countries and Other Areas". Diplomacy in Action. U.S. Department of State. Retrieved 2011-06-19. ^ "NESA Region". NESA. Archived from the original on 30 September 2011. Retrieved 30 June 2011. ^ "Research Areas". The Washington Institute for Near East Policy. Retrieved 19 June 2011. ^ "Middle East and North Africa". unicef. Retrieved 24 June 2011. ^ "Arab States". UNESCO. Retrieved 24 June 2011. ^ "The Middle East". The World Factbook. Central Intelligence Agency. Retrieved 27 June 2011. ^ "USAID Middle East Countries". USAID. Retrieved 20 June 2010. ^ "Travel Advice by Country". Foreign & Commonwealth Office. Archived from the original on 22 June 2011. Retrieved 21 June 2011. ^ "Bilateral Relations". Ministry of Foreign Affairs, Republic of Greece. Retrieved 29 June 2011. ^ "Regions". Republic of Turkey, Ministry of Foreign Affairs. Retrieved 30 June 2011. ^ "Egypt and the Near East". CSAD. Retrieved 24 June 2011.